New Menu Items Have Now Been Added! 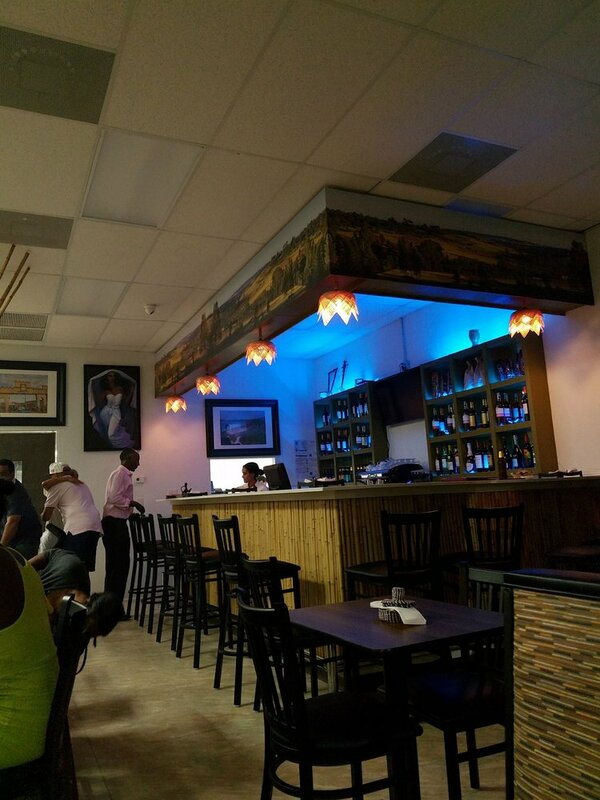 Awash Ethiopian Restaurant opened August 28th, 2017 in the neighborhood of miami gardens. The restaurant was founded by Fouad Wassel and his wife eka Wassel. 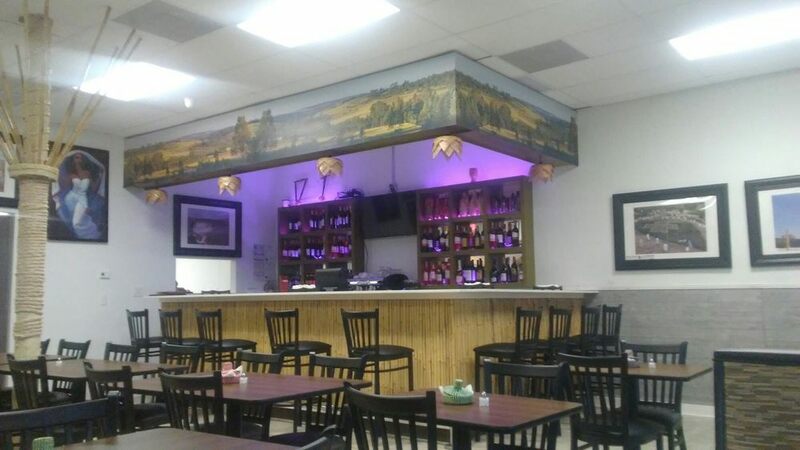 The restaurant encompasses a traditional Ethiopian "Gojo bait" (country style home) environment. The interior features a center piece commonly found in a gojo home, designed by Fouad himself. 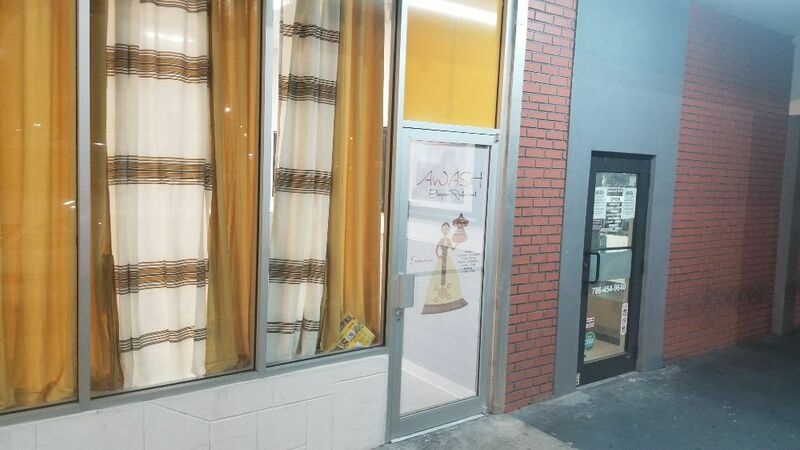 Fouad and Eka have been developing this concept for 15 years, creating a welcoming atmosphere featuring a shop with rare Ethiopian spices, coffee, and tea alongside a decorative bar featuring imported Ethiopian beer and wine, Ethiopian art, traditional music, and a coffee ceremony occurring Friday, Saturday, and Sundays. The name Awash derives from a river found in Ethiopia. The river is signifigant to the country because it travels throughout Ethiopia, never leaving its borders and remaining a source to the Ethiopian people. 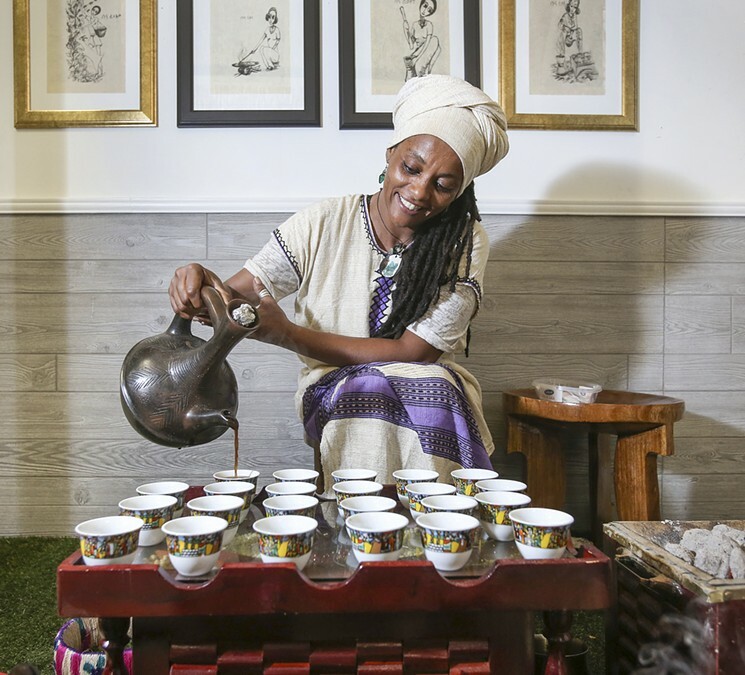 Despite many misconceptions, Ethiopia is one of Africa’s most fertile countries, boasting a rich cuisine and a long, proud history stretching far back to the time of the earliest humans. Its strong cultural heritage is reflected in the food, which is wonderfully diverse, full of color and flavor, as well as containing many important health benefits we could all learn from and apply to our own diets. Ethiopia is one of the largest countries in Africa, spanning a diverse range of landscapes, climates, and peoples, from the ancient Judaic culture of the mountainous highlands to the animist communities that populate the lush South Omo Valley. Ethiopia consists of many ethnics; Oromo, Amhara, Tigray, Gambela, Gurage, Afar and others. The country has withstood a long, tumultuous history. 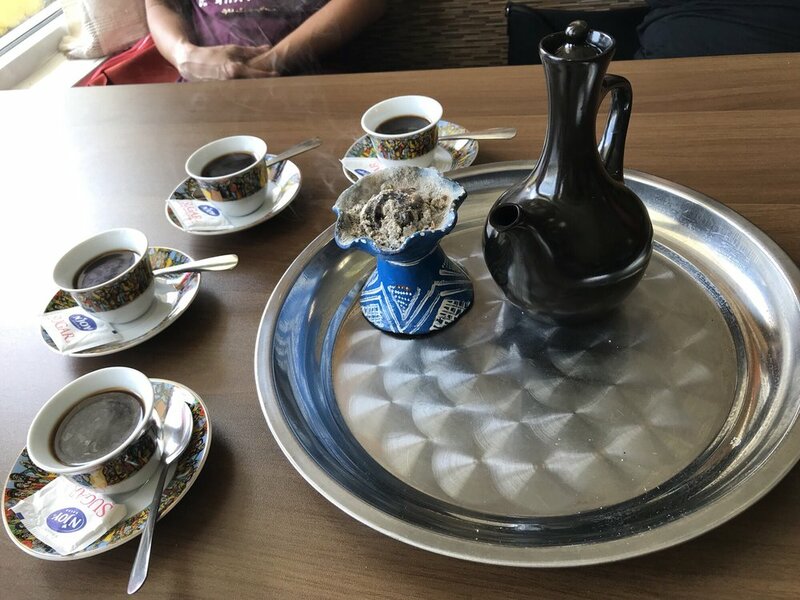 Centuries upon centuries of trade, migrations, and conquests emanating from the rest of Africa, the Middle East and the Mediterranean have resulted in a plethora of cultural and culinary influences. And yet, despite this, Ethiopian cuisine remains truly distinctive. Spices from abroad have converged with indigenous ingredients to create an eclectic mix of flavors not to be found anywhere else. Many of the dishes are unique to the country and together surely comprises one of the world’s best, if commonly overlooked, cuisines. First-time visitors to Ethiopia are almost always pleasantly surprised by the food on offer. The countries of sub-Saharan Africa are not usually associated with noteworthy cuisine in most people’s minds. 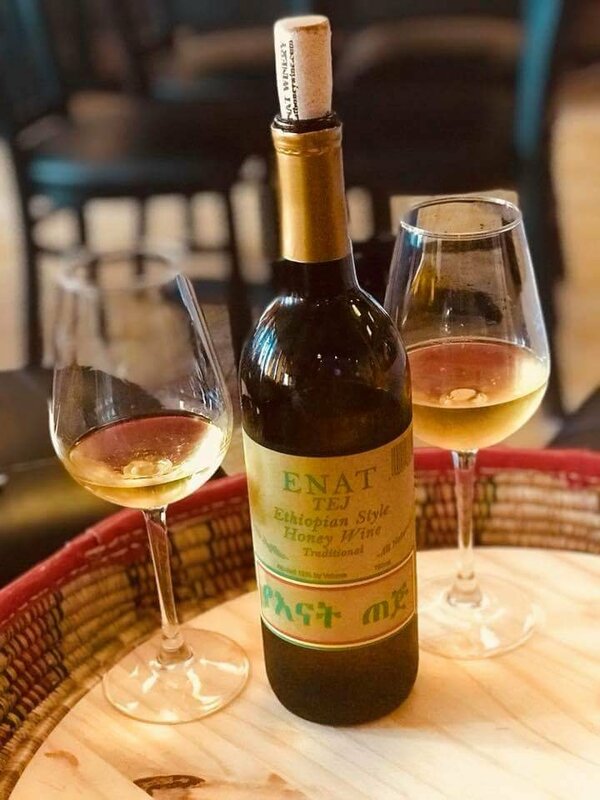 Yet in contrast to the starchy and often quite bland fare prevalent in other African countries, the food in Ethiopia is deliciously spicy, diverse and always a source of great fun and interest, particularly for the uninitiated. 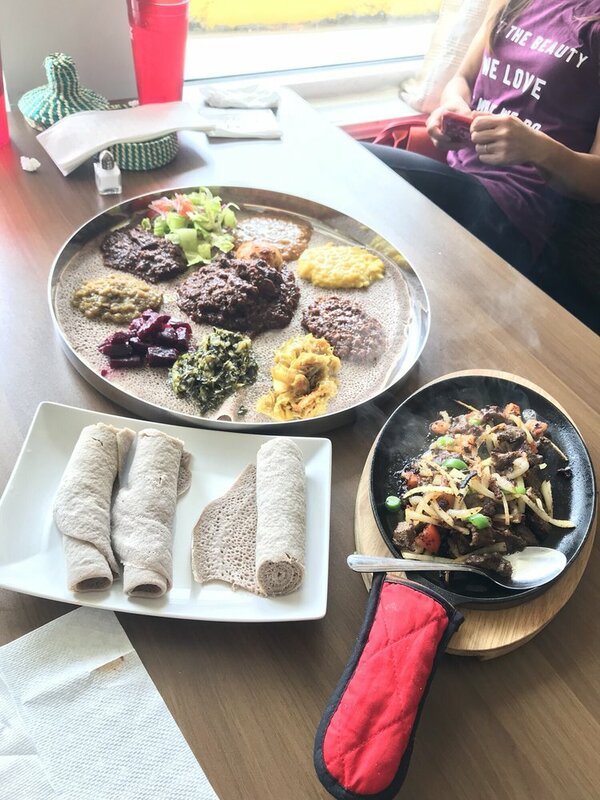 The national dish of Ethiopia is injera, a runny dough-like substance made of the tef grain, which is shaped and cooked into a pancake and served with spicy vegetable and meat stews known as wat. From this basic set-up stems a wide variety of dishes, but first let’s explore the national staple itself, and its many health-touting aspects. The health-boosting properties of injera Injera is the staple of the Ethiopian diet. Encountered at almost every meal, it is used as a substitute for cutlery and, often, for plates as well. It may not look like much, but the spongy flatbread is being touted as the latest superfood on the scene and is thought to be one of the healthiest sources of carbohydrates in the world. Injera is made of the highly nutritious and gluten-free tef grain, which is unique to Ethiopia. Tef contains a high proportion of fiber — more than any other grain on Earth — as well as being a complete protein and a great source of iron and calcium. These health properties are attributed to tef’s comparatively large husk, which is where most of the fiber and nutritional content of any grain is stored. 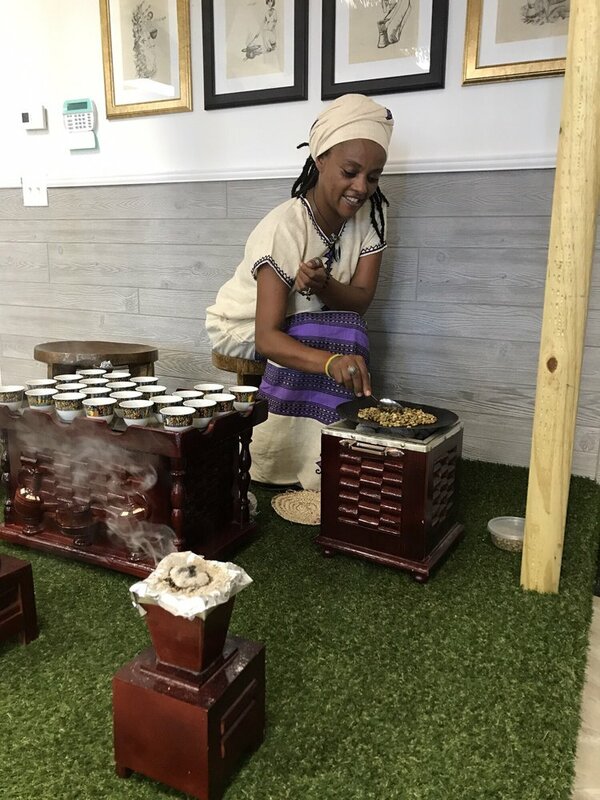 Experts have found that the Ethiopian’s high fiber injera-based diet makes their digestive systems particularly efficient and also explains the very low rates of colon cancer in the country. Perhaps we could learn something from this, about the importance of incorporating more of our own traditional whole grains, such as oats, barley and rye, rather than relying excessively on refined wheat. Injera also has the benefit of being very filling. As a complex carbohydrate, it releases its sugars slowly, so you’re unlikely to get hungry before the next mealtime. Tef is also the only grain containing naturally occurring yeast. Once it has been harvested, the grain is simply mixed with water and left to ferment for three days prior to cooking. This results in a slightly sour taste that is an excellent complement to the spiciness of accompanying wat dishes. Meat makes up an important part of the diet of most Ethiopians. But the country also boasts some of the best-tasting vegetarian and vegan dishes in the world, courtesy of the prolific use of spices. These are served in restaurants on Wednesdays and Fridays, which are the fasting days of Orthodox Christians. Vegetarian wats consist of puréed beans, lentils or split peas, combined with potatoes, carrots or cabbage, along with various spices, which are cooked down into pastes of varying consistencies. An excellent dish for vegetarians or vegans to sample is the popular atkilt bayinetu, a mixed plate consisting of injera and small heaps of various vegetable wats, interspersed with beetroot salad, spinach or kale and vegetable stock. 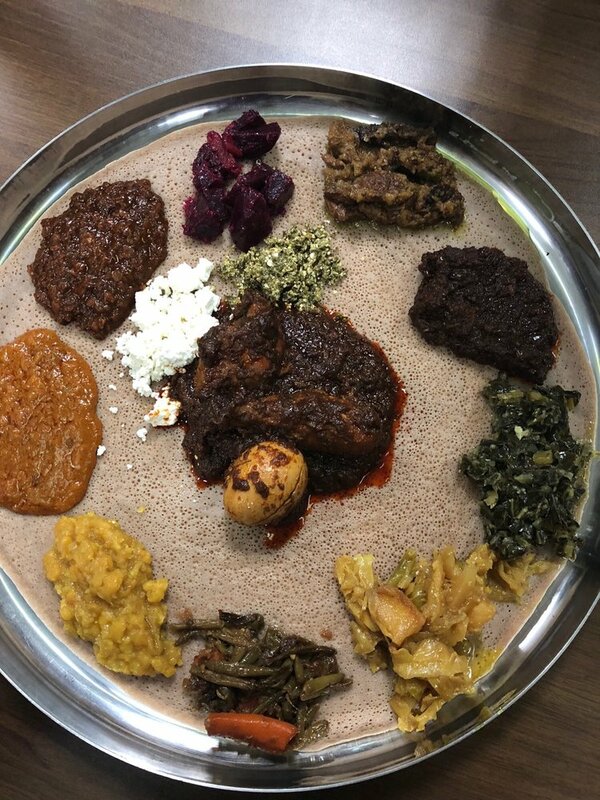 This platter can be found throughout Ethiopia during times of fasting. Indeed, during the fasting weeks of Lent in March and April, Orthodox Christians eat only vegetarian and dairy-free dishes. Many local restaurants in the Christian parts of the country stop serving meat dishes entirely and extra emphasis is placed on creating tasty vegetable wats, so many vegetarian travelers find this a good time to visit. Experts reckon that it’s not only what we’re eating that matters for our wellbeing but also how we eat. Those countries with some of the healthiest populations in the world, such as Japan or those bordering the Mediterranean, tend to emphasize eating as a social occasion and as a sacred time for relaxation or celebration to be enjoyed with loved ones. 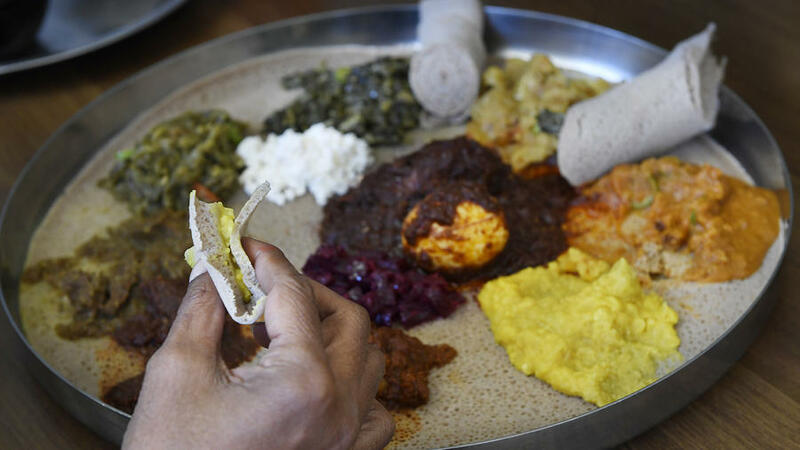 Ethiopians too, by virtue of their national dish, have a distinctly communal-style of eating. 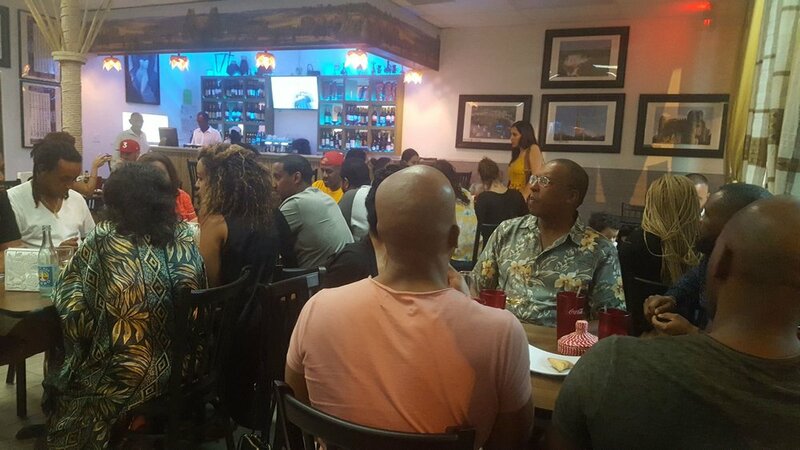 Injera and wat are laid out on large platters and groups huddle around to share from the same dish. 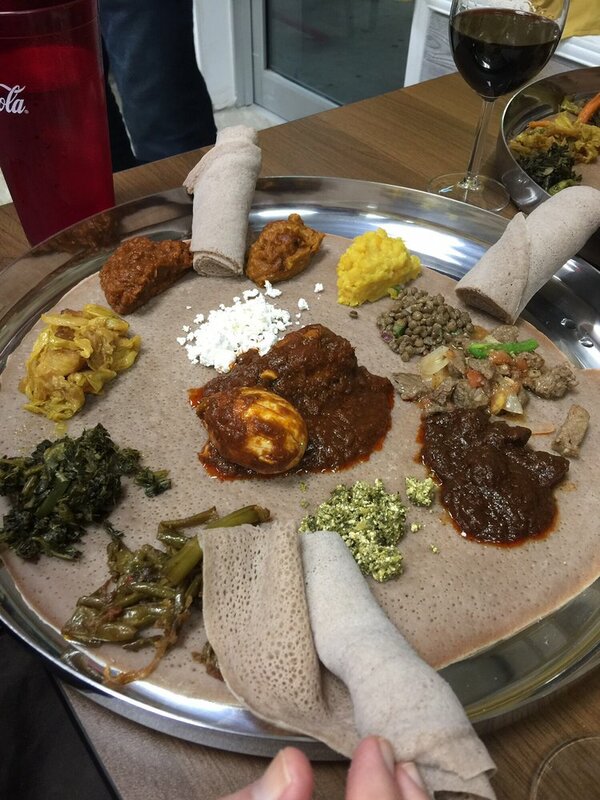 Ethiopians eat with their hands, tearing off chucks of injera to pick up dollops of spicy stew. 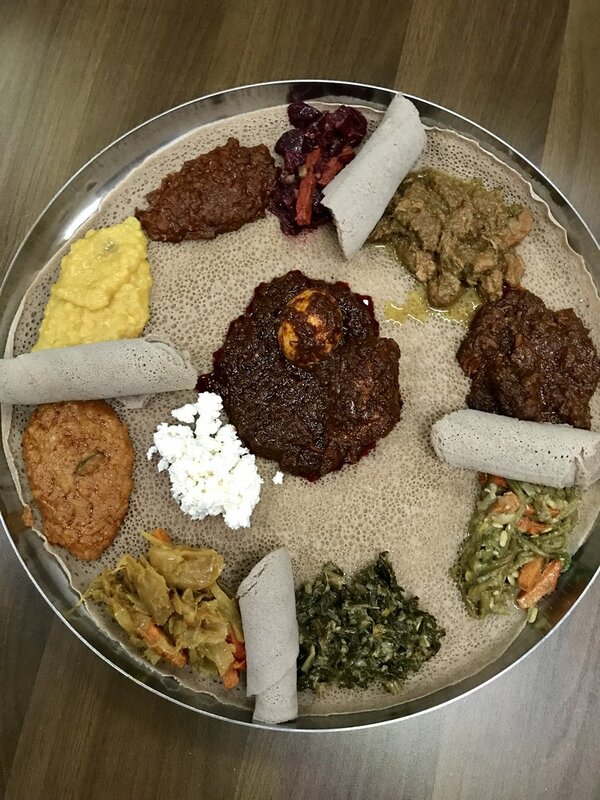 It is also customary for Ethiopians to feed each other in this way (presumably so companions can sample wat dishes that are out of reach on the other side of the platter). 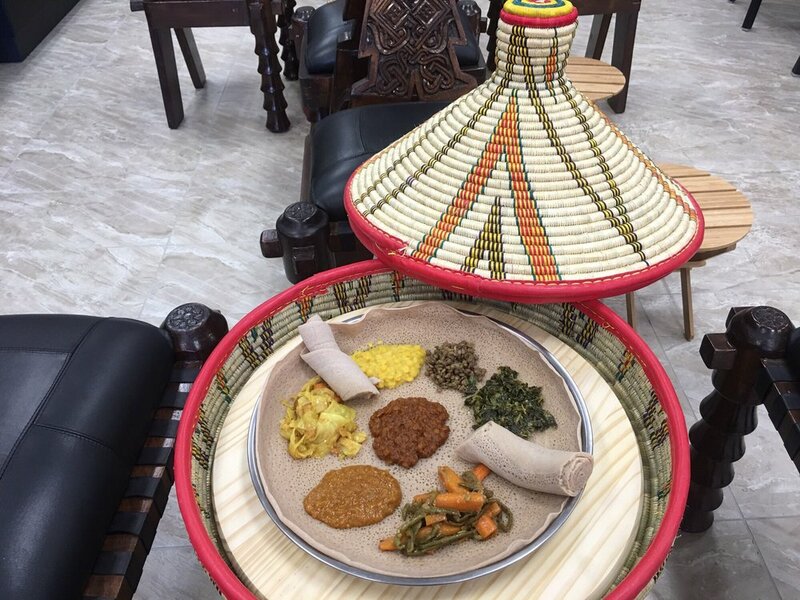 This traditional way of eating predates the founding of Ethiopia itself and remains an important way to demonstrate camaraderie in the country to this day. three pastry crust filled with spiced ground beef. three pastry crust filled with lentils, green pepper, and onion. Black lentil with red onion and green peppers with spices. mixture of Injera, tomato, green pepper, onion, oil and garlic. tender chicken stewed with house spices and red sauce served with hardboiled egg. Scalloped chicken breast sautéed with onion, garlic and chilly served with side salad. extra lean beef cubed and sauteed with onion, garlic, and chili. Cubes of lamb marinated with onion, tonato, garlic, and green pepper. juicy marinated beef with tomato, garlic, and special spice. freshly minced extra lean beef seasoned with Mitmita (spice) and herbed butter sauce served with a side of cottage cheese. split peas and red pepper cooked with cubed lean beef, onion, and garlic. mixture of Injera, sauce with onion, tomato, garlic, special dried lean beef, and herbed butter. mixture of Injera, sauce with onion, tomato, garlic, cubed beefand herbed butter served. fresh and tender strips of beef braised in red pepper sauce and assorted spices. freshly selected lamb braised in red pepper sauce and assorted spices. fresh and tender strips of beef braised in might sauce and assorted spices. combination portions of all the vegetarian, beef, and chicken entrees. Lightly sauteed cubed fish in coated in a mildly spiced sauce with onion Ethiopian Berbere, tomato, and green pepper . Pan fried fish served head to tail with a side of house salad. Good for one person. Fresh shrimp sautéed with onion, garlic and chilly served with side salad. yellow split peas cooked with onions, garlic, turmeric, and green pepper. red lentil cooked with onion, garlic, and red pepper sauce. Collard greens cooked with onion, garlic and oil. cabbage and carrot cooked with onion, garlic and ginger. split peas and red pepper cooked with onion and garlic. Combination portions of all the above veggie entrees. mixture of Injera with house sauce made of onion, tomato, garlic, and red pepper. Cremini mushrooms sautéed with onion, garlic and chilly served with side salad. *kids drinks: apple juice, berry juice, and fruit punch. Check back soon for updates on events to come at Awash. To book an event please reach us on our contact page. Awash offers catering and is available for space booking. Please call or write us for more information.